Went hunting for Shanghainese soup dumplings (xiao long bao) with my folks. It's tough to find a restaurant that makes it just right with tender and well seasoned meat, lots of soup, and a thin wrapper. The popular Joe's Shanghai has got the soup and wrapper down but the meat isn't so tender or flavorful. Maybe the meat would be more tender if it didn't cook as long. We tried the soup dumplings, fried pork dumplings, vegetarian chicken, and Shanghai chow mein at Shanghai Kitchen just a block north of Joe's Shanghai. I was actually surprised by the food. The dishes are much better then Joe's which I find to be really greasy. It is Shanghainese run so points for authenticity. The soup dumpling however, had a thicker wrapper and didn't have much soup but the meat was tender and flavorful. Next I'll have to try Shanghai Cafe. 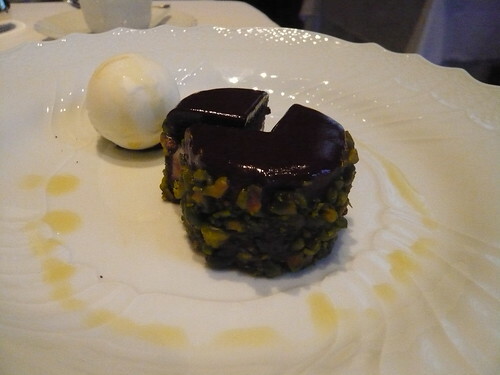 For dinner we went to Del Posto. I hadn't realized it was so formal, sports coat and tie for the men. It's something I can do on occasion but I'd rather be able to relax and fully concentrate on my food without having to worry if I'm using the right fork. But anyhow, the food was good but I think I'm spoiled by my experience a few years ago in Italy eating at local hole in the wall spots. One dish I remember well was shrimp wrapped in a fattier version of panchetta. So fatty it was translucent. So good! 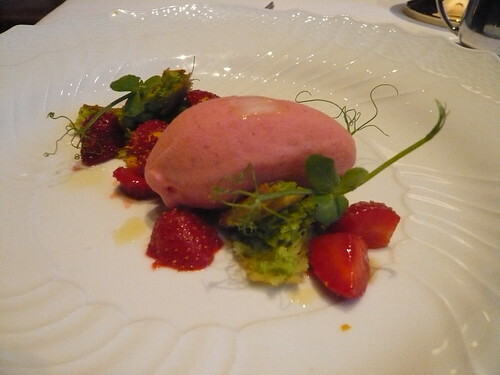 Anyhow, here are the dishes from Del Posto haha. 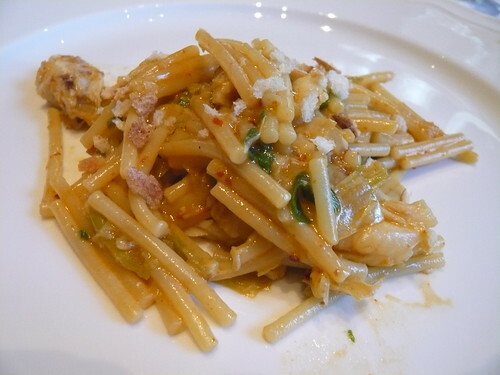 Spaghetti Rotti with Dungeness Crab, Sliced Jalepeno & Minced Scallion. And yes, that's the portion size. 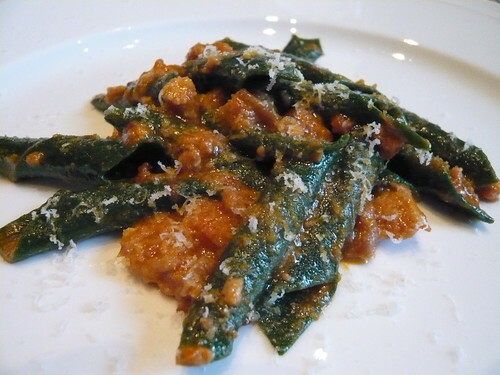 Garganelli Verdi al Ragù Bolognese - If you look closely, the pasta isn't an extruded tube. Each pasta is flat sheet that is rolled! 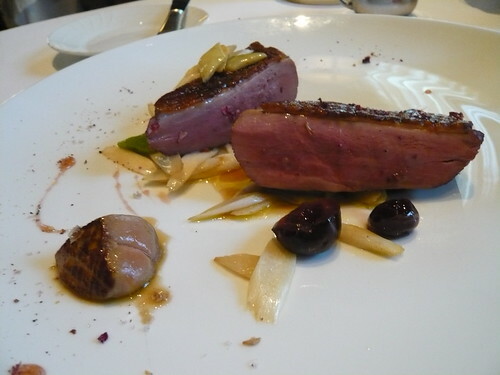 Sliced Duck with Sour Cherries, Shaved Asparagus, Green Beans & Foie Gras Guis for dad - he was happy. 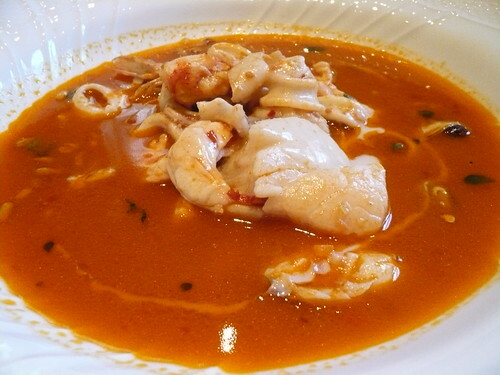 Cacciucco with Blue Prawns & Garlic Bread Soup - the pine nuts and bits of garlic bread really added to the soup. The scallop was really tender, but the rest of the seafood was ok.
Gelati del Giorno - interesting spongy texture, different then any other gelato I've had. 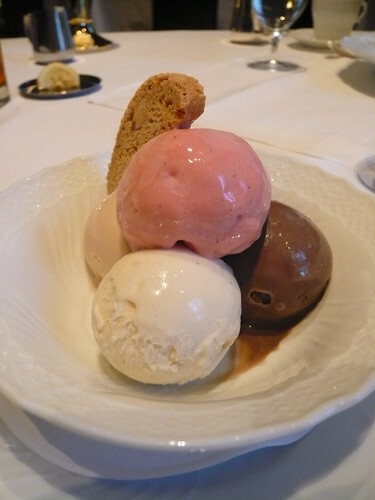 The colors made remind me of neopolitan ice cream but the pink is plum gelato. 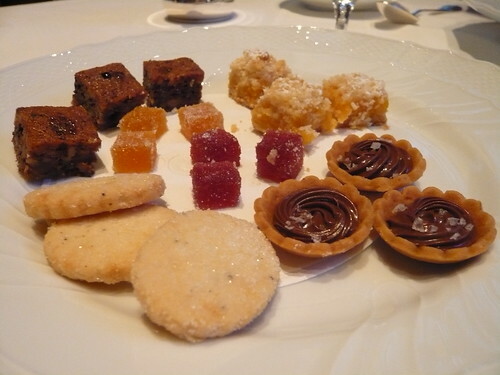 Cookies on the house - never got to try them though, too full so packed them then lost the bag. Oh well. We ended the night with a walk along Highline Park. A first visit for all of us. It was well designed for the urban environment that it was and was surrounded by. It wasn't trying to be a floral garden in the sky. Though potentially a bit dangerous to walk on if one's not careful, I do like how the floor seamlessly and subtly incorporates the plants.